Heads up guys this is an advertorial. This is going to be a new feature on my blog, i am trying out an experiment and i hope it works out for me. I hope you like every one i post about and actually get some of them. My first advertorial post is about the new Infinix Zero phone on Konga.com. 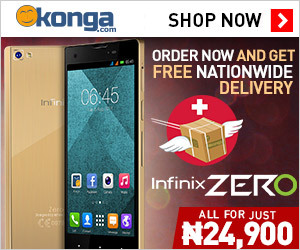 It is amazing how fast the Infinix Zero sold out on the first day it was featured on the Konga website. In a few hours, all the devices were zapped up! Everyone is talking about how much they love the phone! And the price? It goes for an incredible N20,900! The Infinix Zero has definitely surpassed all expectations. It is a game-changer in the world of android mobile technology. This device is a leader in its category of smartphones, excelling in terms of performance and technology. It features superior picture quality of a 13MP camera, speed derived from the powerful Octa-Core processor, the latest Android 4.4 Kit Kat technology and a classy gorrilla glass on metal finish. The only place to get this amazing device online is Konga.com. This is because Konga is the best e-commerce platform in Nigeria as shown by several metrics. So, save yourself the stress of searching and click here to get yours! Buying the Infinix Zero is the best deal you'll get this year! And you don't want to miss it! The End..... What do you think guys? Cool phone or not? Are you serious? I didn't know.